Now that Spring is here, the warmth of the sun beckons the little one outside. It’s time to cast away the heavy coats and gloves of winter, and to dress as fresh and sprightly as the first flowers of the year. Frocks for children are simple this season, being loose and comfortable, both for summer play and for ease of everyday care. 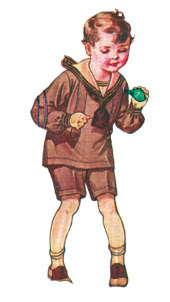 The rounded “boat” neckline is very much in evidence this Spring for children. 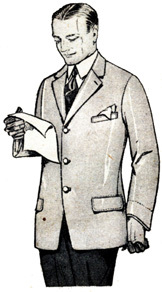 A flat band often takes the place of a collar, made in matching or contrasting fabric. Collars when seen are to be of either the pointed or rounded shape, and are generally made in white trimmed with delicate lace. Narrow ruffles as trim are sometimes used, but only sparingly. Shaped pockets, in the form of flowers, pouches or other whimsical devices lend an air of playfulness to these frocks. Hand embroidery and pin tucks also enliven garments made of a single solid fabric. 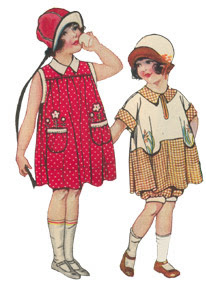 For the children of school and nursery age every day dresses are made of wool jersey, wool crepe, soft twills, mohair serge, plaids or heavier tub materials on the order of linen, linen-finished cotton, gingham, chambray, cotton or poplin. While cotton is usually the best choice of material for the simpler dresses planned for children, it is a very nice idea to have one silk frock for spring. 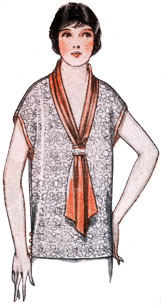 Afternoon and party dresses are of crepe de Chine, Georgette, occasionally crepe satin, taffeta and satin. A very nice choice is a striped wash silk in dull blue with a white background, and also having a narrow stripe of burnt orange to set off the blue. For the tiny tots, the fine lingerie materials, net, Georgette and crepe de Chine are used for special occasions.